Earlier today, The Daily News Record’s Matt Stoss broke the story that Jace Edwards has been given his release and will transfer from JMU. We wish Jace well wherever he ends up, but this isn’t really a surprise. Mickey Matthews was somewhat dismissive when answering questions at the NOVA Coaches Caravan about Jace’s role going forward. He quickly mentioned that Jace had played hurt and then seemed to shift focus to speculating on the chances of Justin Thorpe being granted a 6th year of eligibility. While nothing specific was said about Jace’s future, Todd and I both came away with the impression that his spot as the heir apparent to Thorpe was anything but secure. As a redshirt freshman Jace Edwards was forced into the starting role during Justin Thorpe’s suspension (or “sabbatical” as Mickey refers to it). He lead the Dukes to a homecoming victory over Richmond in his first start, and JMU went 2-3 overall with him under center. He showed flashes of maturity and deserves credit for doing enough to keep the Dukes’ playoff hopes alive while Thorpe was out. Due to his involvement in an off-campus altercation, he was due to serve a one game suspension to open the 2012 season. Whether or not that has anything to do with his decision to transfer is pure speculation at this point however. Edwards missed all of spring practice recovering from shoulder surgery. As a result, Andre Coble practiced as the de facto back-up QB. Presumably, Coble will enter the season as Thorpe’s primary back-up. There is potentially some good depth developing behind Coble however, with a trio of well regarded QB recruits in Michael Birdsong, Ian Fisher, and Taylor Reynolds set to join the team this year. Maybe that had something to do with Thorpes’ decision or maybe he just wanted to go back to Texas. 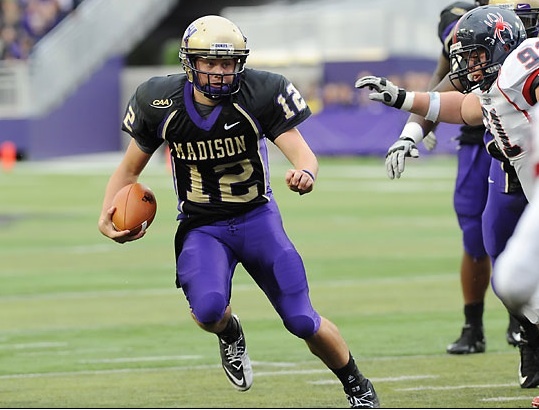 The point is, JMU has some talent in the pipeline at QB. Given Thorpe’s history of injuries, there is a decent chance JMU is going to need Coble or one of the freshmen to step in at some point this season. The good news: Having a WR as your backup QB isn’t so bad when your starter is also one-dimentional. The bad news: JMU is where QB’s careers go to die. I’m sorry. It’s true. The staff treats QB’s like college girlfriends…. never make a real comittment and play two off each other at the same time. First one to mess up gets dumped. As long as they have at least one good looking attribute, it doesn’t matter if they have any other talents (“well rounded”…anyone?). Sometimes she gets high (ahem) and cheats on you, but after you feign upset for a week or two, you let it slide because she has nice “assets”. She stays in your starting lineup because she brings home the bacon most saturday nights, but she’s never going with you to the promised land and you know it. Hopefully one of the new guys (who probably won’t be playing this year) will prove me wrong (at some point in the distant future). In the mean time, just run the wishbone and stop teasing me. Also- can anyone explain the case for JT being eligible for another year? I can’t remember because it seems he’s been playing for us since 1972. 2004 Duke, I always love your comments. Very well put! Yeah, I swear sometimes it seems like JT has been around for so long that he battled both Drew Dudzik and Drew’s dad for the QB spot. I could have the details wrong here, so someone correct me if necessary. I believe JT is positioning the NCAA for a 6th year of eligibility because he redshirted his freshman year and then got hurt in the season opener in 2010, which cause him to miss all but the first half of one game. They’re basically asking that 2010 count as a medical redshirt year. 2004, I’m not sure that’s fair. Rascatti was the man for 3 years, then Landers for 2. Then things got complicated with Thorpe/Dudzik and injuries, and one guy winning CAA ROY, the other guy beating VATech…Dudzik was hurt, then Thorpe was hurt….Don’t recall either being benched for “messing up”, as you put it. After that, it’s really been Thorpe’s job..he just took his “sabbatical” last year, which forced Edwards into service, though I’m not sure he was really in competition for the spot. There hasn’t been a lot of consistency at the position since 2008, but I blame injuries and off-field problems, not performance on the field. The two QB’s mentioned above are the only two MM has ever really committed to- that’s my point (Actually, Rascati/Lezotte was even up in the air until kickoff of the first game). Even with JT and Dudzik is was always up in the air ….even playing the 2 QB system. It’s really hard to stay motivated as a player when you don’t know if you, or your QB, will have a job next week. I just think it would do a world of good for our program for MM to recruit a decent QB, deveop him, and stick with him. If you are living in constant fear of screwing up and getting benched (Lezotte, Dudzik, Edwards), or going to the dog house and never getting a chance (Cosh), it is almost impossible to succeed. That is an enourmous distraction that is more detremental to the team than any opponent. This is especially true with a high profile, key position like QB. In spite of the natural contempt I hold for QB’s, I think you have to pick your man, develop/coach him, and be somewhat loyal to him if you want to succeed. MM apparently take the opposing view, as he does with all other positions on the field, where the QB is just another guy and can be changed in-an-out as needed. The only places I know of in major college football that subscribe to this theory are the ones that run archaic offenses like the flex/ham/wishbone, which concequently, is pretty much what we run. We just totally fake everyone out by lining up in the shotgun and threatening them with our legendary arial assault.